MobileCon 2012 came, saw and conquered the San Diego Convention Center this week, giving enterprise professionals the tools and information they need to succeed in a rapidly changing world and tech journalists a look at the latest devices and news causing stirs on the market. Major carriers like Verizon and T-Mobile rocked the house, while smaller bodies like Cricket got the chance to show of the goods. TechRadar played with Nokia's Lumia 810 and LG's Optimus 9, and chatted up Huawei, OtterBox and others. In a press conference complete with podium-flanking teleprompters, Verizon Chief Technology Officer Nicola Palmer revealed the carrier will roll out its 400th 4G LTE market Oct. 18. Marquette, Mich. is the symbolic city, though a the CTO revealed 17 more markets will also join it, bringing Verizon's total LTE coverage to 417 markets. Big Red is two months ahead of schedule to hit the mark, Palmer gushed, thanks to devices like the iPhone 5, high customer demand and a speedy build schedule. While AT&T and Sprint are expanding 4G LTE coverage on their networks, both fall short of Verizon's offering. The carrier plans to blanket more than 30 markets all the way up the end of the year, and Palmer said that by the time 2013 calls it a wrap, Verizon's 4G LTE pool will stack up to its 3G footprint. Look for Voice over LTE and AWS spectrum-enabled devices next year, too, and further exploration into LTE Advanced. 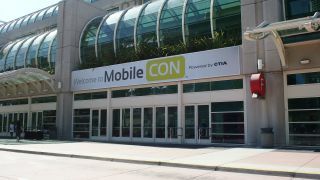 The HTC One VX was one of our favorite phones from the MobileCon 2012 show floor. While we aren't always crazy for plastic phones, the VX's white backplate was an awesome combination of smooth and grippy. It was also removable, letting you swap out the 1810mAh battery and pop in a microSD card with ease. Inside HTC One VX was packing some beefy stats, a dual-core 1.2Ghz processor and 1GB of RAM. Those specs are all the more surprising since HTC considers it to be a mid-range device. When your flagship device, the upcoming HTC One X+, has a quad-core, there's nothing left to do but call a dual-core mid-range. The original HTC One is a great device, and we're excited to see what HTC can do at both a premium and mid-range price point. Since HTC recently pulled out of the US tablet market, the exclusive focus on phones could mean great deals for consumers, and possibly an end to the Taiwan-based company's financial troubles. Research in Motion's BB10 is nothing new - details about the unreleased OS and accompanying handsets have trickled out for some time now. A leaked smartphone may have even surfaced this week, too. Despite the incessant leaks and sneak peeks from RIM itself, it was still good to hear RIM Chief Information Officer Robin Bienfait make the case for BB10, especially in terms of how it can improve the lives of professionals. During a demo, Senior Brand and Marketing Communications Manager Jeff Gadway showed off BlackBerry Balance, a feature that keeps business information (like work email accounts) separate from personal data when switched on. Features like Peep and the BlackBerry Hub page are also geared to make phone actions flow a little bit better and life move a little smoother. BlackBerry 10 and devices to show off the OS should be out in the first part of 2013, Bienfait said. Will Windows Phone 8 take the world by storm? T-Mobile and Nokia are sure hoping so. The two have paired up to offer the Lumia 810, a colorful new device packing the new Windows mobile OS. While our hands-on with the phone at MobileCon 2012 was limited to physically touching the handset (it wouldn't even turn on, so we couldn't play with the Windows Phone 8 OS inside), we were happy to see the handset in the wild.